A little red house is tucked away on the outskirts of a tiny town nestled between San Luis Obispo and Cambria. An old, white picket fence outlines the perimeter and a fragrant overgrown rose bush beckons passersby to stop and smell its yellow flowers. Open the rundown gate, and there are cracks in the concrete entryway leading to a door where orange wildflowers sprout up. It looks like the kind of place where visitors are warmly greeted and handed a hot cup of tea. GREEN AS FAR AS THE EYE CAN SEE: The view from Harmony looking toward Harmony Cellars. It’s just a little red house, but to Aarika Wells said it’s the first place she called home when she started her new life on the Central Coast nearly 25 years ago. It’s where she raised her daughter as a single mom. It’s where her story intersected with the town of Harmony’s story. After Wells and her daughter, Aurora, first moved into the little red house, she began to take over some duties of managing the local chapel, which is a picturesque and popular spot for weddings. But it wasn’t until 10 years ago that she became the official town manager, at the then-owner of Harmony’s request. Yes, it turns out, you can own a town. But not just any town is up for grabs. And Harmony, a place that seems oblivious to the passage of time, isn’t your typical town. The actual town of Harmony is tiny, taking up about 2 acres or so. The greater Harmony Valley—which includes the winery up the road, Harmony Cellars; Harmony Headlands State Park; and privately owned grazing and ranch lands—is loosely known as the area from Villa Creek (where Highway 1 turns inland) to Highway 46 West. 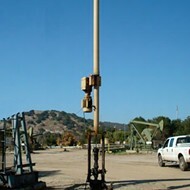 It’s estimated by local residents that the valley is 5,000 acres. The area has its roots in dairy farming going back to 1869. Swiss and Italian immigrants, who saw the homes they left behind in Harmony’s rolling hills and temperate coastal climate, flocked to the area to make fresh milk, cheese, and butter. WINE NOT? 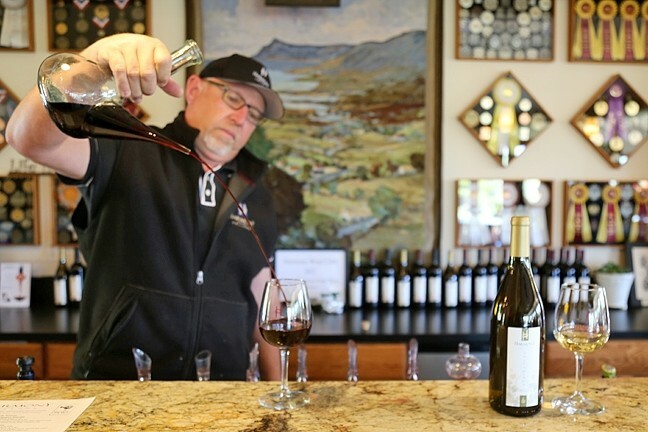 : Michael Rice, sales manager for Harmony Cellars—the winery known for its chardonnay (on the right) just up the road from the town—pours wine at the tasting room. Today Harmony is a bit of a ghost town. The creamery building that originally went up more than a hundred years ago still stands, but there is no butter to churn or cheese to ripen. Black and white dairy cows no longer dot the hills. Outside of the creamery walls you’ll walk the cobblestone ground and find a rustic chapel and a woodsy outdoor gazebo, where lovers still say their I-dos. A pottery shop, glass blowing shop, and a winery known for buttery chardonnay are still popular with tourists who travel from all over the world to walk around Harmony. In April, the sleepy little town began to wake up with the sounds of a thudding hammer, the buzz of jackhammers, and the toppling over of rocks. Alan Vander Horst, a dairyman with roots in California and Texas whose ancestors hail from Holland, bought the town in 2014. He has big dreams for Harmony and its old creamery building. The name Harmony fits this sweet, whimsical area, where one can imagine amiable dairymen milking cows together in peace. Although singer Jehry Miller wrote and recorded the song “Harmonizing in Harmony: Population 18” in the 1970s, the town wasn’t named for what it was, but for what people wanted it to be. Local legend has it that rivalries between warring dairymen led to bloodshed, inspiring the inhabitants to name the town Harmony. It’s a story that’s been told so often it’s taken as fact. It’s even inscribed on a mural painted outside the creamery. The real story is a little different. Debbie Soto has deep ties to Harmony. Her grandmother, Alice Salmina, attended the one-room Harmony School, which first opened its doors in 1875. Soto was raised on a dairy farm in the Midwest and settled down on the Central Coast after marrying her husband. 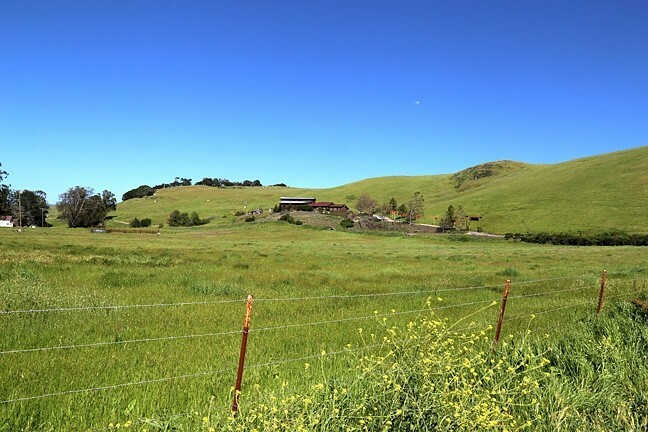 The two reside near Cambria but own grazing land in Harmony. Soto became inspired to write a series of books focusing on one-room schoolhouses after learning of more and more family members who had attended them. The second book in the series, Living in Harmony, came out in 2015. 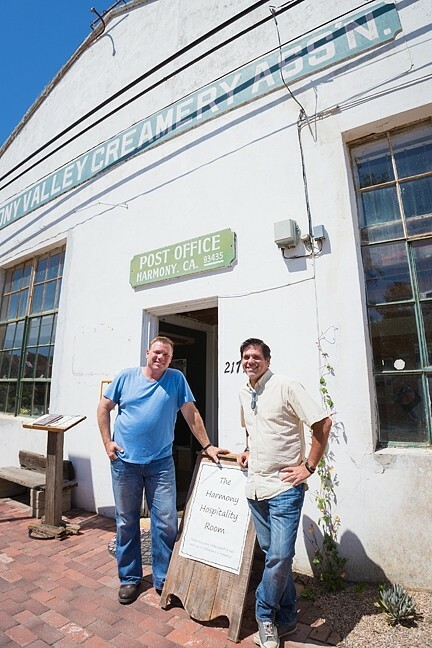 KING OF THE TOWN: Third-generation dairy farmer and Harmony Valley Creamery Owner Alan Vander Horst (left) aims to restore and refresh Harmony’s historic creamery building with a restaurant serving up Swiss-Italian grub and a creamery shop featuring fresh cheese curds and ice cream. Managing partner Tom Halen (right) provides the hospitality know-how. Prior to Harmony’s schoolhouse opening, blood was shed. But it likely had little or nothing to do with dairy. 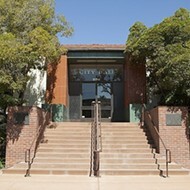 James Yates Stewart, a local schoolteacher in SLO County, married Elizabeth Cocke in 1870 and the pair started their family in the Harmony area. Stewart’s brother-in-law, George C. Cocke, owned or leased the ranch parcel next door to what is now known as the old creamery. In early August of 1874, Stewart arrived at the Cocke family farm near Morro Creek after being away for months teaching in San Bernardino County. He got into an argument with his wife when he told her he wanted to move the family down south where he was teaching. Elizabeth refused to go or to allow Stewart to take any of the children with him. As their argument continued, George stepped in and the two men began to fight. The fight escalated and George stabbed Stewart with a 7-inch dagger. The teacher, father, and husband died about an hour and a half later. George was surprisingly discharged after a preliminary hearing where many of his friends and distant relatives gave testimony in his favor. He murdered his brother-in-law, openly admitted to it, and walked away a free man. 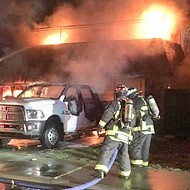 The murder was described in local newspapers as one of the most painful tragedies to befall the community at that time. While it’s not the story Soto expected, it’s the one she found. The next year the Harmony School District was formed and the schoolhouse, located on a half acre of land near the creek, opened its doors. 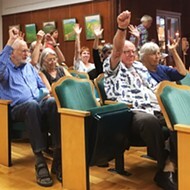 It’s possible that the community members who named the district hoped that the name would bring peace to the valley, which later took on the name of Harmony as well. The Harmony School’s last students left their desks forever in 1930, and the old schoolhouse was torn down in 1950. Today all that remains are amaryllis flowers, blooming every year in bright shades of pink, likely left over from gardens planted by former students. 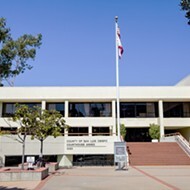 The school sat on land that was once part of Rancho Santa Rosa, a Mexican land grant. Soto feels the land’s story has come full circle in a way. Meanwhile in Harmony proper, new life is being breathed into structures that have stood the test of time. As construction crews work away on the old creamery, Vander Horst and his right-hand man, Tom Halen, look ahead to the future of Harmony. In April, the creamery was gutted, nothing more than walls and dirt. By January 2017, the old creamery will house a restaurant with a bar, a wine lounge, dairy shop, a makers’ space to display local arts, a visitor’s center, and the former miniature post office. By early February 2017, Vander Horst hopes that his farm-to-table restaurant, Bower and Baker (the name is an homage to the men who owned the creamery when it was the Excelsior Cheese Factory), will be serving up comfort food like polenta, risotto, and schnitzel with Swiss-Italian influences to honor the early settlers of Harmony. 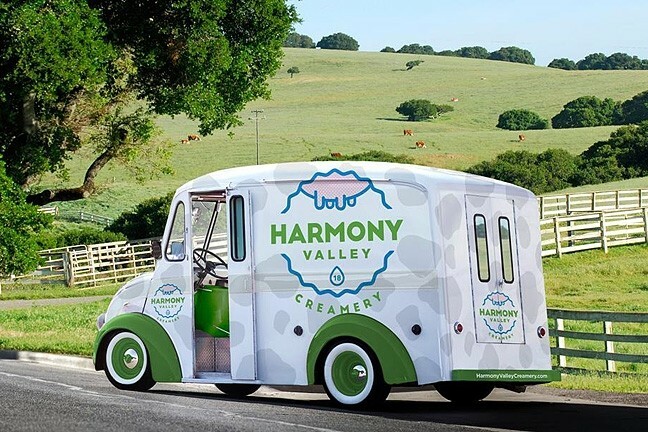 WE ALL SCREAM FOR ICE CREAM : This mock-up depicts what the Harmony Valley Creamery ice cream trucks will look like as they roll around town, bringing creamy yumminess to SLO County. Vander Horst, a man who splits his time between the Central Coast—where he, his wife, and kids now reside—and Central Texas—where his family’s dairy farms are—gets a little uncomfortable when asked what it’s like to own a town. And Harmony isn’t exactly like other towns. There’s no mayor or local government, for starters. The iconic green signs that say “Harmony, Population 18” along Highway 1 and right past the little red house (which is technically outside of Harmony’s limits) on the border of town went up in 1970, but the number hasn’t changed since. It’s a rough estimate and refers to the inhabitants of the entire Harmony Valley. Suffice it to say there are far less than 18 people living in the 2 acres that make up the official town of Harmony. How much does it cost to buy a town? You can poke and prod, but Vander Horst won’t tell. “A couple of bucks,” he’ll tell you with a sheepish grin. Well how much does it cost to restore a town? “A couple of more bucks, and a lot of heart and soul,” Vander Horst said. His partner, Halen, estimates that grazing land in the Harmony Valley goes for $8,000 to $10,000 an acre. Given that the 2 acres Vander Horst bought boast the creamery, pottery shop, glass shop, and the chapel, it’s safe to say he paid more than $20,000 for the town. 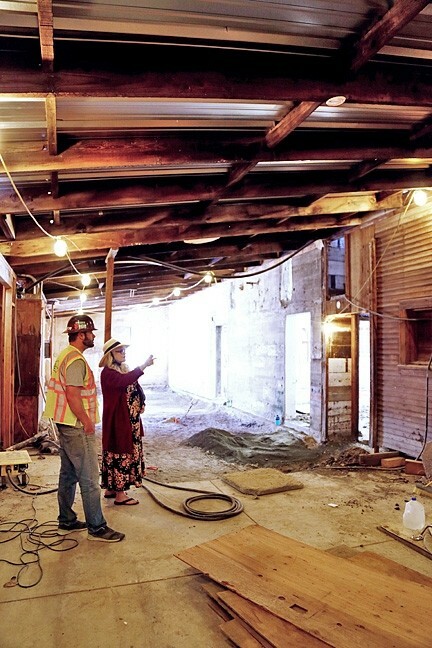 GOOD BONES: Town Manager Aarika Wells and specialty construction site manager Dustin Bauer discuss plans for the old creamery’s renovations. But Vander Horst doesn’t want to talk money, he wants to talk dairy—specifically cheese and ice cream. The new dairy shop will serve fresh cheese curds, warm out of the cheese vat, twice a day. Retro milk bottles from Harmony will decorate the inside. Two old-school refurbished milk trucks from the 1950s and 1960s will get a new lease on life as Harmony Valley Creamery ice cream trucks, serving up sweet, creamy scoops of Madagascar vanilla, chocolate, cookies and cream, mint and chip, strawberry, and butter pecan ice cream. One truck will stay in Harmony and the other will roam around the county, bringing ice cream and good cheer to all. The ice cream, made by Negranti Creamery in Paso Robles, debuted at the California Mid-State Fair last year and then vanished for a time, increasing its popularity. Vander Horst and Halen hope to have at least one of the trucks up and running in time to serve a milk stout ice cream and/or coffee stout ice cream floats at the Firestone Walker Invitational Beer Festival on June 4. From old-fashioned ice cream to buildings so old the walls nearly whisper their stories, Harmony invokes an overwhelming feeling of nostalgia. Wells has seen several town owners come and go and has faithfully stuck to her post of town manager, making sure events run smoothly and warmly greeting visitors as she overflows with words to describe the rich history of the town. While she has since relocated from the little red house where her daughter learned to ride a horse and played in the nearby creek, she still lives in the Harmony area. Wells lights up when she thinks about all the new people the renovations will bring to the town. PERFECT HARMONY : Interested in learning more about the quirky town of Harmony? The book 'Living in Harmony by Debbie Soto' is available on amazon.com for $16.95. 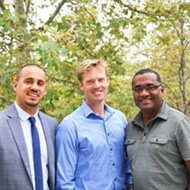 You can also visit harmonyca.com for more information. Ryah Cooley is eagerly awaiting a double scoop of Harmony Valley Creamery’s luscious strawberry ice cream at rcooley@newtimesslo.com.